MAC and its members established the Paul Stothart Memorial Scholarship following the passing of its valued colleague, Paul Stothart. 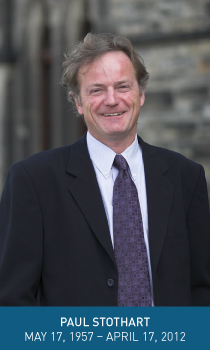 A graduate of Queen’s University (MBA Finance, Bachelor in Civil Engineering), Paul was an accomplished professional who was passionate about advancing the Canadian mining industry in his role as MAC’s Vice President of Economic Affairs, which he held from 2006 to 2012. The scholarship is valued at $3,500 and will be awarded annually to one student studying either a Bachelor or Master of Economics, or a Master of Business Administration. Candidates must also demonstrate an interest in mineral economics through current or future course work. Students are able to submit their applications until April 15, 2013. The inaugural scholarship will be awarded to the selected candidate for the 2013-2014 school year. For more information about the scholarship and how eligible students can apply, please visit www.mining.ca. Recently, MAC formed a partnership with the Prospectors and Developers Association of Canada, Publish What You Pay-Canada and the Revenue Watch Institute to improve the transparency of extractive sector payments to governments. In September, all partners announced that it signed a Memorandum of Understanding, which led to the creation of the Resource Revenue Transparency Working Group. The working group will develop a framework for the disclosure of payments to governments for Canadian mining and oil companies operating domestically and internationally by June 2013. Once complete, the group will make policy recommendations to federal government policymakers and/or provincial security regulators for the Canadian adoption of mandatory disclosure requirements based on the framework. The announcement follows the newly-adopted reporting rules under the Dodd-Frank Act in the U.S., which will require publicly-listed oil and mining companies to disclose payments to governments. More transparent payment information will help assure mining communities that they are receiving appropriate benefits from both mining operations and governments, as well as reduce instances of corruption and bribery in developing countries. MAC released its annual report on mining industry payments to Canadian provincial and federal governments this past September with some impressive findings. The report, prepared by ENTRANS Policy Research Group, found payments reached an estimated $9 billion last year in aggregated mining taxes and royalties, corporate income taxes and personal income taxes. This marks a near return to the peak levels seen prior to the recession, and a 21% increase from 2010 levels. Total payments reached an estimated $9 billion in 2011. Royalty/mining tax payments increased by about $700 million over last year, with most of the increase coming from Alberta, Saskatchewan, Newfoundland and Labrador, and Ontario. The mineral sector has contributed $69 billion to government treasuries over the past 10 years -$30 billion to federal and $39 billion to provincial coffers. Of particular note is the study’s findings that show a steady increase in overall mining tax and royalty payments since the 2009/10 figures seen during the recession where payments to governments declined by almost 60% compared to 2008/09. In 2010/11, royalties and mining taxes began to recover, increasing by 45% from $2.2 billion to $3.2 billion. In 2011/12, royalties increased by a further 22% to $3.9 billion, which is well above the 10-year average. For a copy of the report, please visit www.mining.ca. 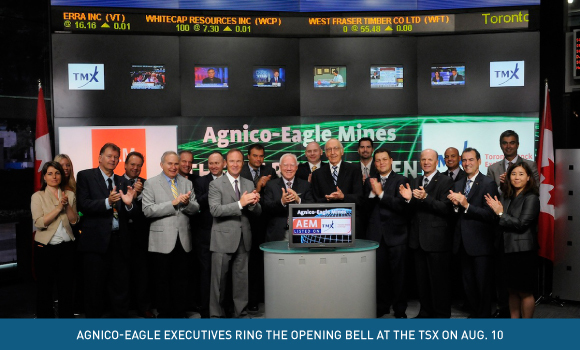 MAC would like to congratulate its member Agnico-Eagle Mines Limited on its 55th year on the Toronto Stock Exchange (TSX). Canadian-headquartered, Agnico-Eagle currently operates three gold mines in Canada—LaRonde and Lapa in Quebec, and the Meadowbank mine in Nunavut. The company also has two other mines in Finland and Mexico. Agnico-Eagle traces its history back to 1953 when five small mining companies joined together to form Cobalt Consolidated Mining. In 1957, the company changed its name to Agnico Mines Limited and began trading common shares on the TSX on December 27th of that year. The company, which has since changed its original trading symbol from AGE to AEM, commemorated its anniversary by opening the day’s trading session on August 10, 2012. The TSX is a global hub for mining finance, and is currently home to 60% of the world’s public mining companies. Figures from 2011 show that the TSX and TSX-V have more than 1,600 mining companies listed on their exchanges. 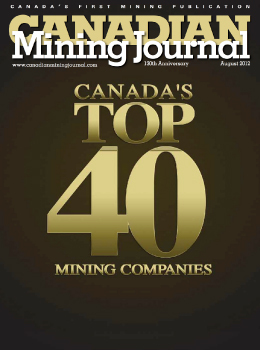 The Canadian Mining Journal has announced its annual Top 40 list of Canadian mining companies by gross revenue, and MAC members account for 16 of the companies listed. MAC would like to congratulate our members on a profitable year and for this great recognition. MAC members strongly represented the list’s top 10 with Barrick Gold landing this year’s second highest spot, followed by Suncor Energy at No. 3, Teck Resources at No. 4, Kinross Gold at No. 7, Canadian Oil Sands Trust (backed by strong revenues from its Syncrude* project) at No. 8, and Cameco at No. 10. The list continues with Agnico-Eagle at No.13, IAMGOLD at No. 14, BHP Billiton (Ekati) at No. 15, Centerra Gold at No. 17, Inmet Mining at No. 19, HudBay Minerals at No. 20, New Gold at No. 23, and De Beers Canada at No. 27. Finally, Imperial Metals and Taskeo Mines finish off the list at No. 39 and No. 40 respectively. *Syncrude Canada is a member of the Mining Association of Canada. MAC’s President and CEO, Pierre Gratton, recently delivered a keynote speech to the Vancouver Board of Trade on why the industry remains bullish on mining’s long-term outlook despite current market volatility. In his speech, Gratton reinforced how regulatory reform, investment in infrastructure and the promotion of strong trade relations with countries such as China, the world’s biggest consumer of metals, will keep Canada globally competitive. “The mining super cycle is not over, it is taking a pause. This is the nature of the mining business, which is cyclical,” said Gratton. Despite a slowdown in Chinese growth to 7.6% from decades of 10% average annual growth, Gratton noted that most prices remain at relatively high levels. He also emphasized that the long-term fundamentals that have supported commodity prices over the past decade remain. In his speech, Gratton emphasized that China consumes about 40% of minerals and metals today, compared to just 5% in the 1980s. Demand for urban housing is projected to rise to 200 million units by 2030, meaning the country will need to build 10 million units a year over the next two decades just to meet projected demand. As such, China will continue to require Canadian commodities in massive quantities. MAC member New Gold Inc. hosted the grand opening of its New Afton Mine in Kamloops, BC, on September 16, 2012. It was a celebratory day in British Columbia as the province celebrated its second new mine to open in as many years. Currently, more than 400 people are employed at the New Afton Mine, which began production earlier in June. As a testament to the mine’s positive impact on the local economy, 75% of the mine’s workforce was hired locally, including more than 100 Aboriginal workers. 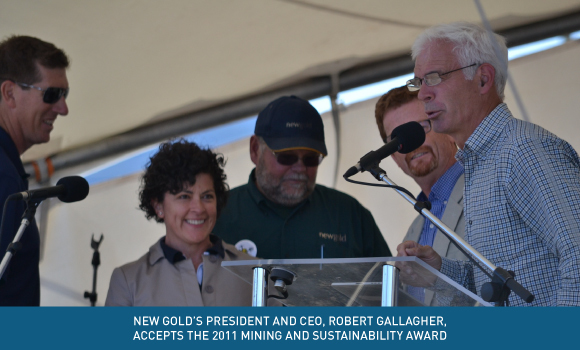 The same day, New Gold was also named the winner of the 2011 Mining and Sustainability Award. The award, which recognizes New Gold’s work on New Afton, is a joint initiative of the Mining Association of British Columbia and the Ministry of Energy, Mines and Natural Gas. New Gold was awarded based on its ongoing commitment to health and safety, community engagement, the environment, advance reclamation and conservation throughout the course of the New Afton project. The New Afton mine is the second new major metals mine to open in BC since 1998. New Afton is an underground gold, copper and silver mine, developed by New Gold at a cost of $760 million. The mine is expected to yield an average of 85,000 ounces of gold and 75 million pounds of copper annually over its expected 12-year mine life.